Capturing vibrations and converting them into electricity is an idea whose time has come. The Center for Energy and Greenhouse Technologies, of Australia, has developed a kinetic energy cell capable of generating electricity from vibrations or motion. Researchers at the University of Bristol, in the UK, are investigating devices which use springs with a mass on the end to capture vibrational energy. At the University of Calgary, they are experimenting with harvesting electricity from the movement of musicians and the vibrations of their instruments. 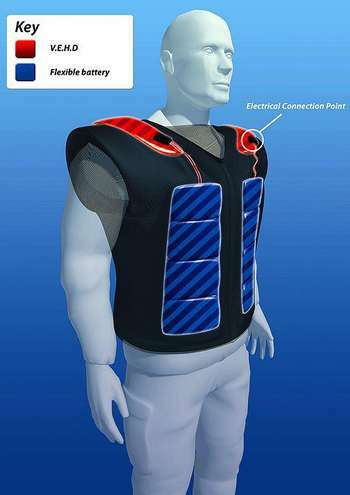 At CSIRO, in Australia, they have developde the FIED, the Flexible Integrated Energy Device, which is worn as a vest. The kinetic energy cell is a micro renewable energy source from Australia, which is able to generate electricity from the motion of cars, trucks, and people. It is meant to replace small standard and alkaline batteries, with the hoped for impact of reducing the pollution of a battery's chemicals. The Australian invention is designed to work where an intermittent, or on and off, power supply is needed, and where the motion of a car, truck, or ship exists. The technology of this device consists of seven components and include an innovative new type of coil construction. The device can be ?tuned? to optimize its operation in a broad range of vibrations. The kinetic energy cell can be used for electronic identification of vehicles at tolling booths or shipping container identification. In these situations, the kinetic energy cell can replace batteries. The cell can be completely sealed, making them suitable for a variety of weather conditions. Currently, the unit is the size of a 9 volt battery, but there are plans to make it even smaller. David Eastwood, Investment Director of Information City Australia stated, ?We are investing in the kinetic energy cell because we see it as a leading edge Australian technology that has serious potential offshore, across many markets and applications. We believe parallel developments in both microelectronics and the kinetic energy cell devices themselves will combine to open up a wide range of new applications in the future.? At the University of Bristol, a team has been investigating how the vibrations caused by machines, such as helicopters and trains, can be used to produce power. Vibrations from the moving human body and household appliances may also be harnessed. These energy-harvesting devices, using mass and a spring, are based on a phenomenon named 'resonance to amplify small vibrations,' allowing useful energy to be extracted. This new device can process a wide variety of vibration frequencies simultaneously (while other devices require a specific frequency to operate efficiently). These energy harvesters also replace batteries, and are meant to be used for wireless medical monitors for people's heart rate and blood pressure. Dr. Stephen Burrows explained, ?Even just a few milliwatts can power small electronic devices, like a heart rate monitor, or an engine temperature sensor, but it can also be used to recharge power-hungry devices, like MP3 players or mobile phones. At the University of Calgary, in Canada, Natalie Robertson is studying the ?good vibrations? of the concert stage. She is using the stage vibrations to power an LED light installation at the main gate. Robertson stores the vibrational energy as electricity in batteries. She calls her system a vibrational energy harvester, and describes it as using the musician's movement and their instrument's vibrations. Natalie explains, ?The display isn't necessary, per se, but it's cool and engaging. The LED display will be a direct reflection of power generated each day. It will reset each morning, before the gates open, though the data collection is a 24 hour process. It would be feasible to attach this type of technology to bridges or street lights. Anything that vibrates.? John Hielbert, the festival's production manager, said, ? The music and the vibration create the lighting exhibition, so it draws nothing and it's made by the actual festival. I think conceptually, it's right up our alley.? Natalie Robertson said the experiment is about people and energy. With the data she collects, she will be able to create a formula which will help in understanding how to power other projects. She would like to see Calgary act as its own battery using the wealth of vibrations available. The FIED (pictured above) is a vest which transforms vibrational energy into electricity, which gets stored in the flexible batteries. As an individual wears the vest, vibrations he or she creates are harvested and sent into the rechargeable battery, which has has plug for recharging electronic devices. Vibrational energy, unlike other renewable energy models, does not rely on sunlight, or wind, but movement, which is readily available from a number of sources. This energy may be stored in rechargeable batteries, or ultra-capacitors, or the device may simply provide a steady flow of electricity from constant, repetitive vibrations. The need is real. Wireless sensor devices are being used more and more as human technology advances. They are being used for environmental monitoring, surveillance, and medical equipment, to name a few. Vibrational harvesters can be used for equipment identification, lighting, or recharging electronic devices. They can be used to power this equipment instead of relying on batteries. In many situations, batteries are a clumsy solution because they run down and have to be replaced. The benefits of vibrational energy harvesters include long lasting operability and no disposal of toxic chemicals. In the coming years, where ever possible, these devices will be used to replace batteries. It's simply the intelligent thing to do.